Now that NYCC is behind us, it is time for our little band of journalists to start sifting through the great stuff we were able to learn, and the great people we were able to meet. One of the highlights for me was getting a chance to sit down with Neil Sorens, Creative Director for Zen Studios. You should recognize the studio’s name from the many pinball tables we’ve reviewed over the past few months, so it was great to finally get a glimpse into the sort of thinking and development that went into their creation. If you enjoy the interview, check back soon for our review of one of their latest tables, Sorcerer’s Lair. BrainLazy: Thank you for meeting us. Maybe you want to introduce yourself? Neil Sorens: My name is Neil Sorens. I’m the Creative Director for Zen Studios. BL: First, before we start anything else, what does a Creative Director do? NS: Basically oversight of all of the game design that goes on at the studio, whether it is pinball tables or new concepts. BL: Alright. Now, you (Zen Studios) are known for your pinball. I’d say pinball is your thing. We’ve been lucky enough to get review copies of virtually every table you’ve put out since the first promotion you were a part of. I just finished playing Sorcerer’s Lair last night. Where do you start developing the idea for a pinball table? NS: Well, since the tables take so long to make, and we’ve got lots of designers, I mean, when they are designing one table they are already coming up with lots of ideas for the next table. You know, they may have an idea for a mode or a table feature, so they will build the rest of the design around those central features. BL: Have you been a pinball fan your entire life, or is this sort of a new interest? NS: Off and on. Of course until I started working for Zen. BL: Pinball tables, you say, take a long time to design. Now, pinball games have fallen out of favor, especially physical ones, since there aren’t a lot of arcades around. It wasn’t until I started playing the Zen tables that I realized how incredibly complex the game of pinball really is. The tables are very information dense. What sort of challenges do you have when making a new table? NS: The density is definitely a big concern. Especially with the high definition screen aspect ratio, which is the opposite of a traditional pinball table. So we have to use lots of different cameras, so that’s a big challenge. And then, of course, the density compounds that problem. You’ve got all of these ramps and targets, and we try to pack as much into the table as possible, so that people can get weeks of play out of it. Some of that stuff tends to step on each other. I mean, you put this one ramp here, and you put this other target here, then you find out that they don’t work together. And so you’ve got a hundred different table elements, and you’re trying to make them work together. There’s always something that doesn’t quite work. BL: I imagine there’s a whole lot of tweaking involved. BL: Now, the physics, I’ve got to say; I played some pinball when I was younger, and when I started playing this game, I was was astounded by the fact that this isn’t so much a pinball game as a pinball simulator. The physics on the ball are remarkably good. Do you think that any of your tables could be made into physical tables? NS: Oh yeah, definitely. If you’ve ever seen the underside of a pinball table, it is almost as complex as the top of the table. We’ve never done a layout of the electronics and stuff, which is a big part of traditional pinball design, but I think it could be done. BL: You’ve been doing a lot of work with Marvel. How did you get teamed up with Marvel, and how has it been working with them? NS: Originally we worked with them on Punisher: No Mercy for the Playstation 3. It was an arena based, multiplayer-only shooter. It was our first FPS, it was a fairly low budget game, and the problem with that game was that people compared it to Resistance or they compared it to Gears of War. So here we have a sub-one million dollar shooter compared against a fifty million dollar shooter, so we learned we had to focus on one genre, pinball. And so, when we came back to our second generation of pinball, we came back to Marvel and we said, ‘Well, you know, that whole Punisher thing didn’t work too well, but we think it would work really well with a pinball table. 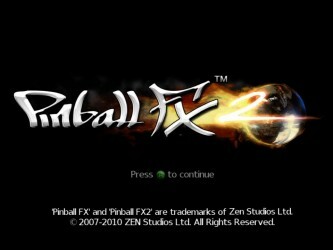 So it was kind of last minute with Pinball FX 2. We started, actually, during the summer of 2010. We had to work pretty hard to get those tables out by December of that year. BL: You’re doing a remarkable job. I have to say, what I’m most impressed with is that Marvel has been doing a movie blitz for the last couple of years, and lots of the tables feature characters that are showing up in the moves. But the tables are more about the comics than the movies. Was that a decision from the beginning, or was there an attempt to do any tie-ins? NS: It just makes sense. Obviously the movies have a different style. Comics have a single image and fairly sparse dialog in comparison to the movies. In a pinball table, all we can do is one-liners. I mean, there was a little bit of back and forth with Fantastic Four, but you can’t have extended conversations and develop the characters they way you can in movies. So it is much more rapid-fire, very terse dialog that you have in comic books. So that’s one thing. And then, of course, comic books just have a whole lot more depth than the movies, because they’ve been developed for years and years. Tons of storylines, lots of different facets of characters to explore. That just gives us a lot more freedom and a lot more material to work with. BL: It is funny that your Captain America table pretty much had more characters from the comics than the movie did. Now, you mention that you worked on a different type of game before you found your niche. Twisted Pixel, who you also worked with, had done so as well. How did you get teamed up with Twisted Pixel? BL: So what do you want to talk about in terms of what you’re working on for the future. Is there anything you want to push? NS: Well, let’s see. We’re doing a table announcement, so by the time you publish this, you’ll be able to read about that. It is the second table in our Marvel: Vengeance and Virtue pack. There is going to be two Vengeance and two Virtue tables. We’ve already announced Ghost Rider, obviously, is going to be Vengeance. And today we are announcing X-Men. Virtue, obviously. The focus is on Charles Xavier training the students. There will be various X-Men characters; Nightcrawler, Cyclops, Storm, Jean Grey. Magneto is the main enemy. BL: It seems like Magneto and pinball would work together pretty well. NS: Yeah! He’ll take apart various parts of the pinball table and, you know, use magnetism on the ball. It is pretty cool. We’re real excited about it. There is a lot of team mechanics as well. We look forward to showing that off a little bit more. BL: Sounds great. Well, again, thank you very much for meeting with us, and good luck with everything you’re working on.